It has petals of two different types. Cut a length of wire and string one C bead onto it. Fold in half to unite the wire ends together (Picture 1). Now string a set of C, D and E beads onto both wire ends (Picture 2). Go through the last bead of the set, stringing the wire ends in the opposite directions. Join the wire ends just under the last bead. What you have got now is an axis of a flower petal. Cut a rather long length of wire and string the last bead of the set onto it. Unite its ends with the ends of the first piece of wire. 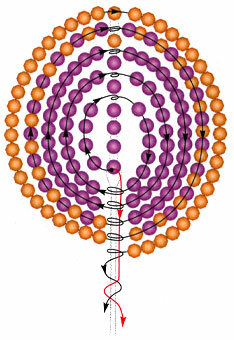 String the number of beads that is enough to make five pairs of loops (Picture 3) onto the long wire end. To fix a top part of the loops go through a bead of the axis, and to fix the bottom part of the loops go under the last bead of the axis. Cut one more piece of wire. 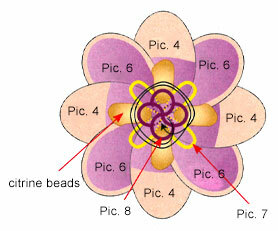 Fix it above the last bead of the petal axis so that you get two equal wire ends. 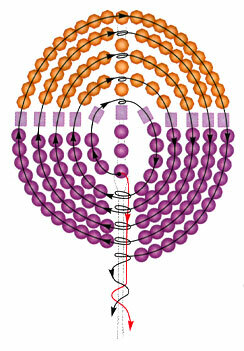 String D, E beads onto each end (Picture 4). Join the ends together and twist them with all the other wire ends of the petal. Work them in a similar way. Make an axis (Picture 5) in C, D. Now work five pairs of loops (Picture 6).Work four flowers of each type. 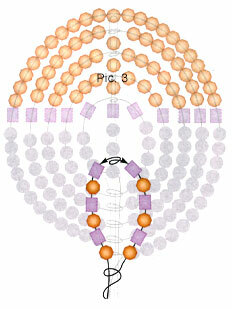 For stamens work four loops in dark beads C (Picture 7) and four more loops in light beads D (Picture 8). Gather the loops together, placing the dark loops in the middle. Twist all the wire ends together. Attach the petals one by one, so that they overlap. Again, twist all the wire ends together. Cut another length of wire to connect all the petals together: go up and down the petal bottoms, fixing A beads between them. Twist the wire ends together and roll them in a circle. Press the circle to the back side of the flower and glue a piece of leather onto it. Work two symmetrical ropes in netting, using C beads (Fig. 1). The original design has 18cm ropes, but you may vary their length to match your desires. Embroider the upper part of the ropes in C (Fig. 2). Bead the lower part of the ropes (Fig. 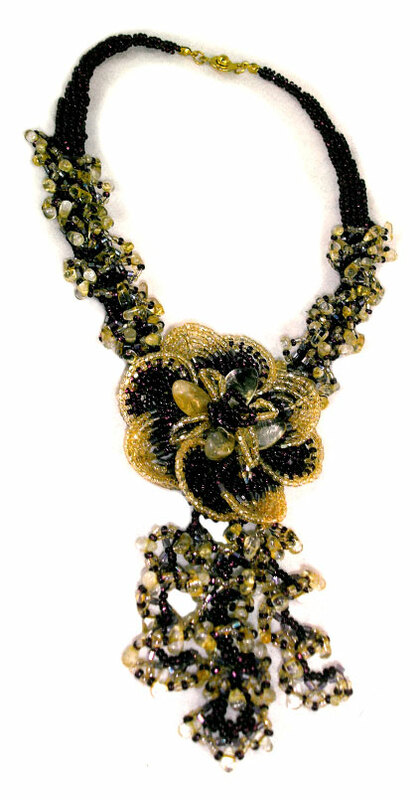 3), using all kinds of beads and citrine tumble. Attach the wide ends of the ropes to the flower (Fig. 1) by strings of C beads. Go through the beads marked 1, 2, 3, 4, 5 and 6 while attaching them. Attach a clasp (Picture 10). Work a central pendant. Weave a 2.5-3cm stripe in C beads (Fig. 4). Do not cut off. String 8-9cm of C Bead Ogalala lace, using B, C, D and E (Fig. 5). Work two more pendants 8-9cm long (Fig. 5). Attach all the pendants to the bottom part of the flower.